After much hesitation due to a pretty hefty schedule, I decided to attend the London Leadership Summit, which took place at the Stock Exchange last week. Am I glad I attended? Absolutely! Because not only was it packed with valuable content, it also reminded me of the necessity to take time out of the norm to connect, learn, & grow! The speaker featured in this series' first article is no less than UK Country Manager for WPP and all-round trailblazer Karen Blackett, and here are the elements of her talk that most resonated with the challenges I often see in my clients. For Karen, a great leadership team comes together when “The Avengers Assemble”: everyone on the leadership team brings their own super-hero power, and it’s not always about “getting on”, but more about bringing together diverse views, skills and experience, to make a richer team and effective senior leadership for your business. How diverse is my leadership team and are we set up to each play to our own super power? What are those super powers that my peers & I bring to the team? 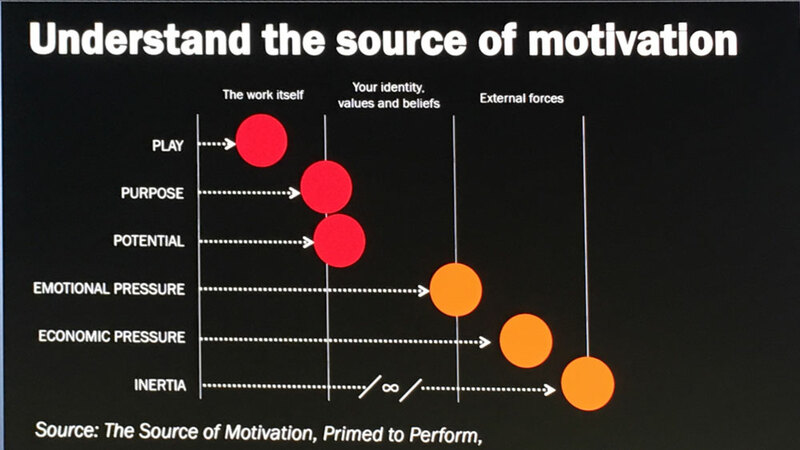 Karen then shared insights from a great book, Primed to Perform, with a simple model that helps identify what drives motivation at work, and highlights the difference depending on whether such drive comes from an internal or an external factor - see the image on the right! In short, beware of the worst driver you can have in your business: INERTIA. In fact, did you know that Metro Bank offer all their employees £2,000 to leave, should they not feel the culture or role is right for them, after their induction or any kind of training? An efficient way to eradicate inertia! Karen brought to our attention that, according to a study led in 2013 by the Deloitte University Leadership Centre titled "Uncovering Talent, A New Model of Inclusion", 61% of people (66% of which were women and 83% of which were LGB individuals) are not bringing their true self to work. SIXTY-ONE PERCENT - shocking, isn't it? • Is this something that I do in my role as a leader? Too often, people cover who they truly are because they are simply not connected to their Professional Values. How connected do you feel to yours? Here's a quick & free framework I created that will help you (re)define yours. Karen highlighted the importance of people being able to speak their truth to power. If you don't know what's going on in your business, well, you don't know what's going on in your business! Your people, leadership team and indeed you as leader need to feel that it is "psychologically safe" to speak their truth. Holding “IF I RAN THE COMPANY" days, where every employee is invited to offer their opinion about what they would & would not do, if they were in charge. You can read more about it in the fifth paragraph (titled "How do you overcome self-doubt?") of this interview Karen did with UPSU. Include “BETTER OUT THAN IN” sessions at the end of every Leadership meeting. This gives people an opportunity to get anything off their chest well-before it makes their blood boil! The watch out here, is how you model the behaviour you want to see in your organisation by how you respond in these situations - if you foster a shame & blame culture, instead of eradicating inertia, you will eradicate psychological safety. Sharing our Leadership approaches & resources enables us to support each other to be Greater Leaders, create Better Business and enjoy Richer Lives. Did you recently attend a thought-provoking Leadership event? I'd love to hear about it & about what most resonated with you! In the meantime, stay tuned for the second article of this London Leadership Summit series by signing up to my newsletter here, or let's book a call to chat it all over and exchange Leadership hacks!